What a happy photo! Nice contrast to the gray skies we’ve had here the past couple of days. What a beautiful and clear photo. thanks cocomino – happy summer to you and your family! 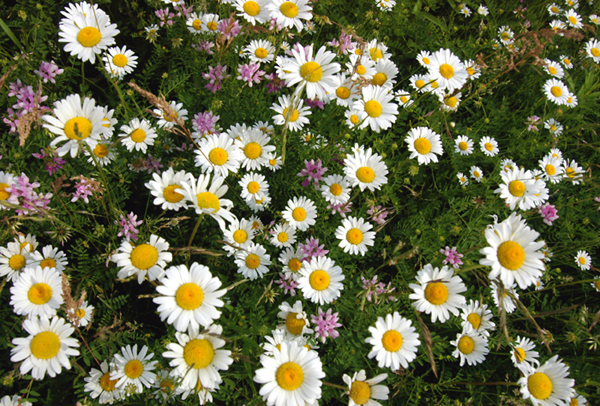 Very pretty and bright – clover and daisies together; a great combination! The daisies are like miniature suns. Happy Summer Solstice to you too! thanks Meanderer – happy summer to you too! loving the Stonehenge photos! fresh, vibrant, the pictures so beautiful you can almost smell the fragrant flowers. thanks island traveler! It sure is a great time of year – thanks for stopping by! They just keep comming back again and again and again. They are such sturdy, reliable flowers. This is a small field in the middle of the city right next to a busy road and the daisies and clover thrive here. A perfect symbol Sheila for the summer solstice! thanks eremophila! just wish I could freeze time… now the days are getting shorter… and for you, longer! What kind of lens did you use to get this perspective? it is my Pentax 18-35 mm… set around 20 mm to get the wide angle perspective.